I sat back swirling the honeyed richness of a sip of Riesling in my mouth and admired the opulent interiors of Micheal Mina. As I watched the army of waitstaff go about in quiet efficiency, I contemplated on the storied journey of haute cuisine. France is widely credited for the elevating Western cuisine into a sophisticated, multi-sensory form of indulgence with its complex sauces, artful presentation and well-defined courses. But all that did not happen over a day. During the medieval times, feasts were common among the high and mighty. Multiple courses of food were prepared but always served together. Eating with bare hands were the norm then. These banquets always ended with a selection of desserts, cheese and spiced wines. Towards the later years, royal cooks such as Taillevent became celebrities and wrote influencial cookbooks. I was brought back to the present as the first course of my dinner arrived. 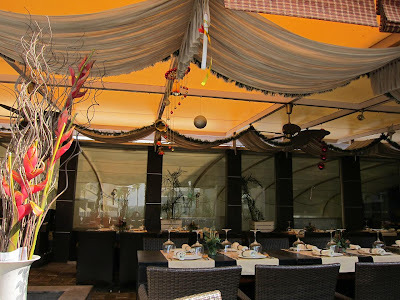 I had chosen the three-course prix fixe menu that employs Mina's famous 'trio' concept and includes dishes that have become classics at this restaurant over the years. 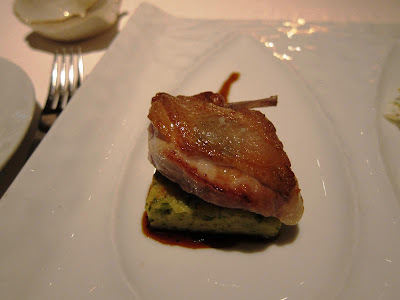 The trio of Wolfe Ranch quail in front of me looked exquisite! 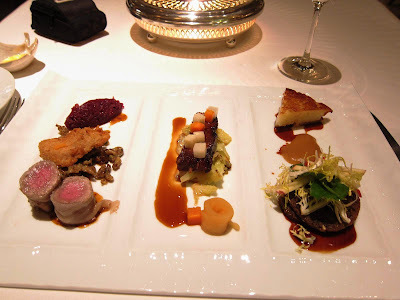 The first preparation was a herb-roasted breast with poached prune and sauce perigourdin, the second a leg confit jombonnette with pomegranate aioli and frisse salad, and the third was seared foie gras with persimmo coulis and pistachio butter. The variation of texture and taste from the crispness of the breast to the soft fleshy confit and finally the soft decadence of foie gras made for an amazing start. 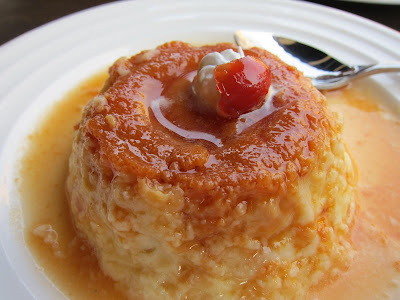 France's famous haute cuisine took roots during the 17th century. This was a time when the guilds had evolved: a system that regulated the food industry and forced specialization among food vendors and establishments. You could now be a butcher, a grocer or a baker but had to stick to only one thing. This was also the time when French cuisine began changing dramatically. Heavy and exotic spices from distant places were passe. They were replaced by natural flavors and local herbs. 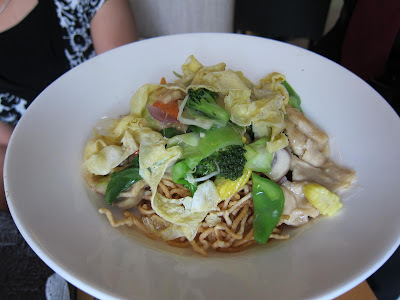 Cooks began focusing on enhancing the taste and flavor of meat and vegetables instead of masking them; freshness of the key ingredients attained primacy during this time. My second course was in front of me now: the Trio of Fatty Pigs. A Tenderloin with shnitzel and spatzle that reminded me of Austria, a Short Rib with braised cabbage and poached quince, and Braised Shoulder with potato rosti and apple mustard. The pork was a medley of tastes and textures. Very exciting, especially the crisply braised shoulder! Also very filling with all that meat and thick sauces. It was only in the late 19th century that haute cuisine in France became organized into its currently recognizable form. Escoffier who was a central culinary figure during this time is acknowledged as the man behind modern restaurant kitchens of the West. He divided the kitchen into five stations: one each for the cold dishes, the starches and vegetables, the sauces, the roasts, and the desserts. 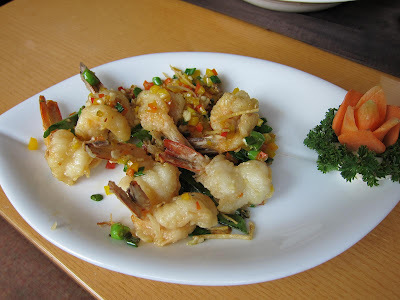 Cooking beame team-work even when preparing a single dish. The great hotels that were built during this time over Europe and America became home for chefs that were eager to please discerning modern palates. Americans took time to embrace French cooking. During the colonial days, Americans had a distinct disdain for French cooking techniques and that continued for some time. Course Three tonight was pastry chef Catherine Schimenti's Dessert Trio: Buttermilk panna cotta with lemon, huckleberry-ginger ice-cream, Chocolate mousse cake with salted caramel and mascarpone, and Squash cheesecake with rosemary and honey pine-nut. 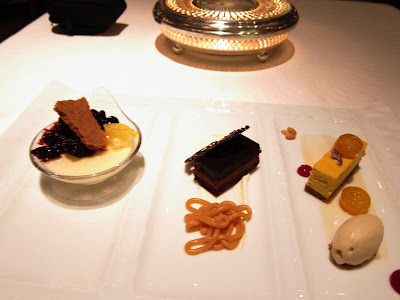 The panna cotta and the cheesecake were particularly delightful! 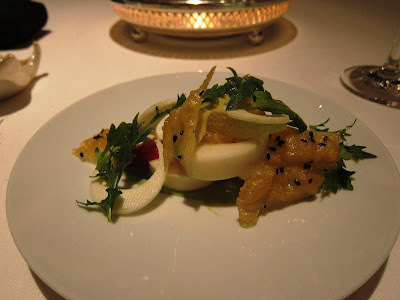 I must also mention the amuse bouches at Michael Mina tonight: a trio of seafood delicacies that included a gazpacho, a shrimp salad and was followed by an excellent Hearts of Palm Salad that had a nice and tangy taste of grapefruit. Hopefully, Michael Mina will continue to delight in spite of a recent setback - losing one star in the recently published 2010 Michelin Guide. As French haute cuisine made its way across the Atlantic to the New World, French cooking itself underwent change during the 20th century. War and Portuguese immigrants brought in new ingredients and new flavors. 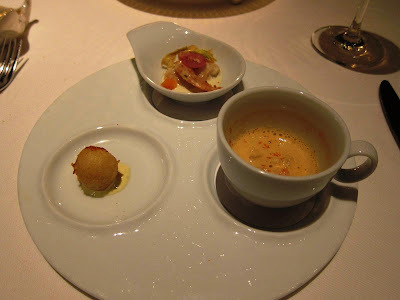 Nouvelle - new - cuisine came into being with simpler sauces and increased emphasis on presentation. Back the USA, the popularity of Julia Child's books and television shows finally brought what was once the cuisine of aristocracy to everyday Joe's dining table. 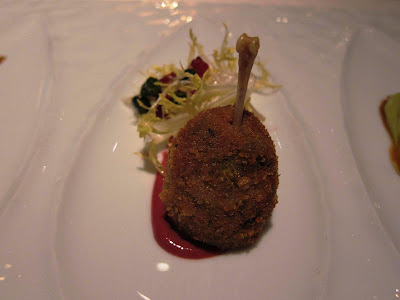 Coming next in this series: New American Cuisine and Luce in San Francisco. 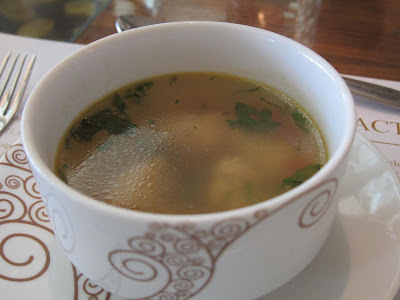 The West View at The Maratha has been the most satisfying culinary discovery in a while! This traditional western grill in Mumbai has an innovative concept that does away with the printed menu altogether. 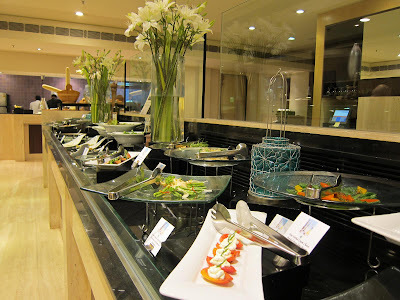 Marinated, herbed and spiced meats are tastefully laid out on a buffet-style counter as are the many appetizers. 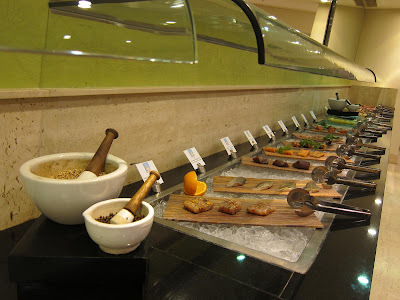 You can choose all that you like and the chef will grill the mix to your liking. 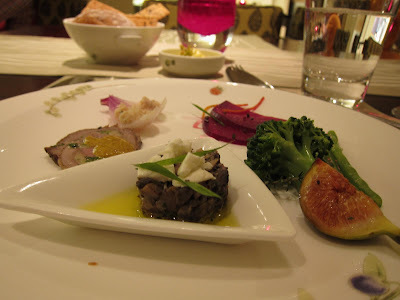 I started with a visit to the Cold Table and choose from a selection of artisan cheeses, fresh salads, and delicately fashioned vegetarian and meat-based hors-d'ouevres. There were dozens of meats, seafood and other vegetarian stuff from which to select from. Every one of them looked good. 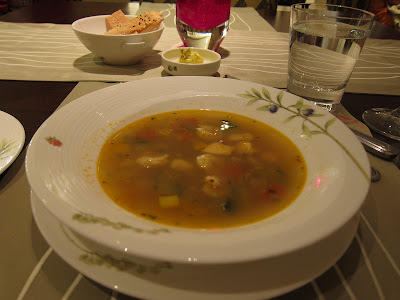 Then I sat down to sample my appetizers and the soup of the day, a clear sea-food soup. All the other tables were occupied by Westerners tonight. Not many Indians have developed a taste for the Western grill apparently, even in Mumbai. 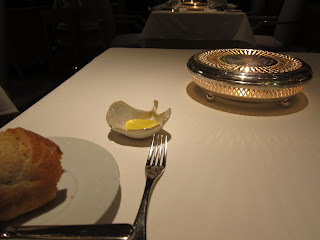 My soup was delicately flavored and the breads they put on the table were freshly baked too. Finally, it was time for the real thing. The grill selections arrived and they were perfect! The Indian salmon with rosemary, cracked chilli and orange zest was very flavorful. 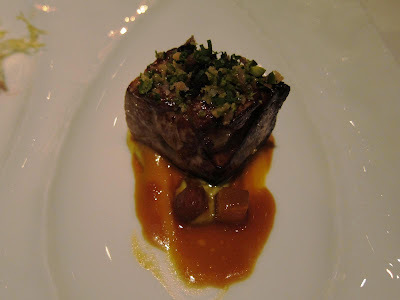 The Andaman tuna with chives and cracked pepper was and interesting variation of taste. 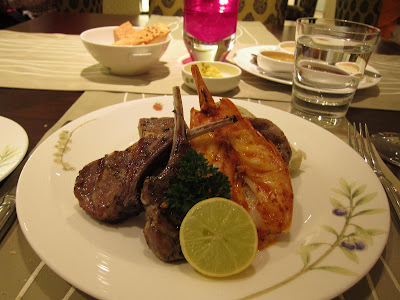 The large Kerala prawns with chili and garlic rub was delightfully crunchy while the Japanese quail with sage and Jamaican jerk spice was suitably exotic. I ended with the New Zealand lamb chops with fine herbs and garlic pistou and the pork spare ribs with star anise and rosemary which was served seperately. 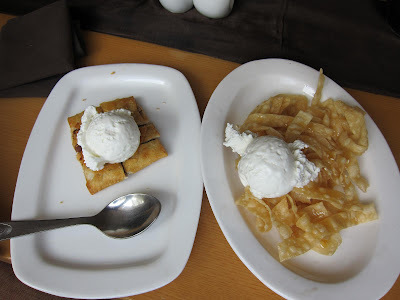 Both were stand-out dishes and I had a strong temptation to repeat them! I finished off with an apple pie. This was overall an outstanding dinner. I expect to be back here the next time I am at The Maratha. The menu keeps changing daily and in addition to those I sampled, they had Icelandic halibut, Arctic squid, wine-poached artichokes and much more. The dining tables at West View are well spread out in the open and airy room. The ambiance is contemporary and chic. 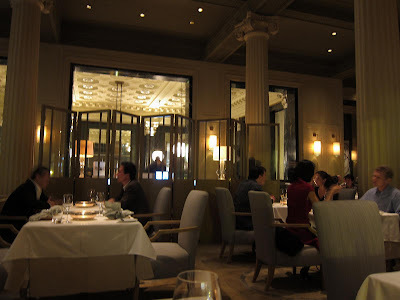 The restaurant itself was very quiet with few tables occupied at the time I walked in. Try this place if you are near Mumbai airport and have a few hours to spend during the evening. You won't regret it! 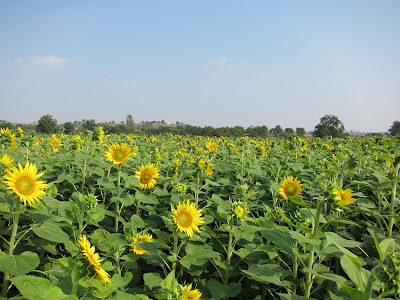 Fifty kilometers from Pune lies a tiny village surrounded by tamarind groves and fields of barley, corn and brightly colored sunflowers. But what makes this little village special from others are the hundreds of peacocks that have made this place their home. Morachi Chincholi. 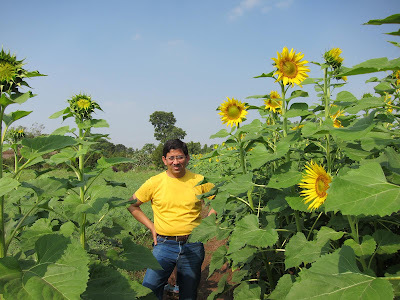 Located deep inside rural Maharashtra yet close enough for a day trip from Pune. The drive down Nagar Road on the Pune-Admednagar Highway SH27 for the first 30 kilometers was smooth. We went past the many factories - Bharat Forge, John Deere, etc. 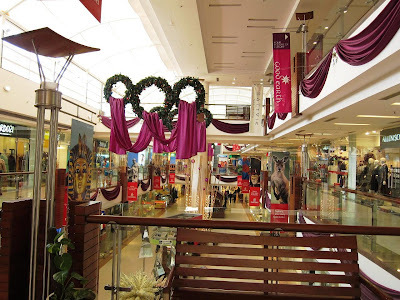 - and warehouses that are located here just past the Pune city limits. We then turned into Kanhur Mesai Phata right after crossing the Velu River in Shikarpur. Now the road was getting narrower with a few bumpy streches. 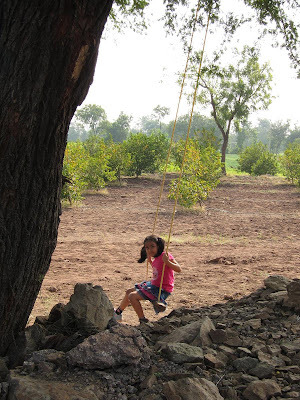 There were long distances filled with swaying stalks of grains, vegetables and orchards. The only sign of modern civilization were the electricity lines along our road. Amazingly, my cellphone still worked and I wondered where the towers were located - I couldn't see any. After crossing the small villages of Hiware and Dhumal Pimple we finally reached Morachi Chincholi. We stopped in front of a farmer's house and made arrangements for lunch. It was already noon and there were no peacocks in sight. However, the green and yellow fields made for a lovely sight in the distance. We learnt that the peacocks are best viewed at dawn and when the sun begins to set. 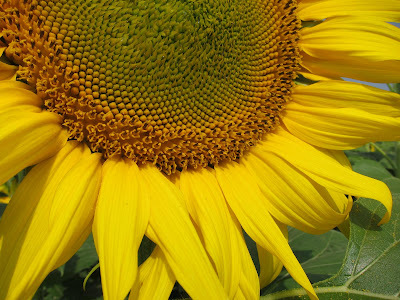 During the daytime they usually take shelter from the hot sun by hiding in the orchards and forests. 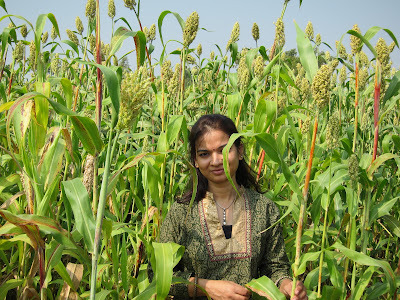 We spent the next hour walking through the fields and taking pictures before going back for lunch. Lunch was a simple affair: we sat cross-legged in traditional Indian fashion in the open verandah of the farmer's house as he and his wife served us with freshly made bakri - a flatbread made of millet, pithle - a dish made by boiling chickpeas flour with water until thick and tempered with mustard seeds and chopped green chillies. 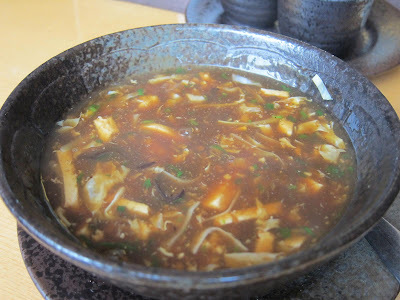 They also served raw onion and radish, lime pickles and eggplant in a hot and spicy peanut gravy. 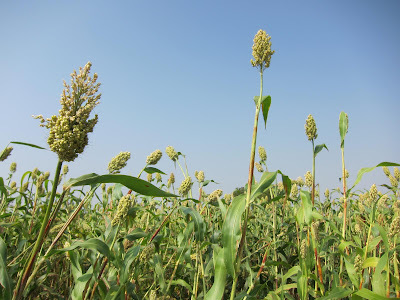 A typical Maharashtrian farmer's daily fare. 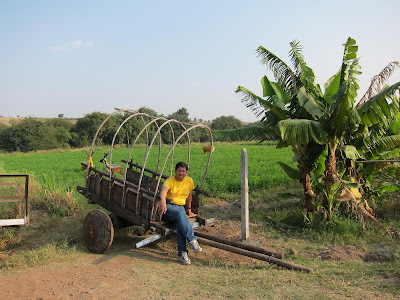 We then moved into the Chincholi village, the road to which is adorned by a rather large arch. 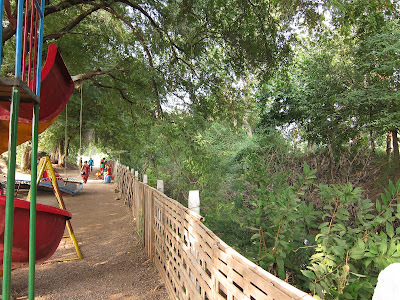 We stopped at Mayur Baug - a rustic resort that has a lot of interesting attraction to keep kids busy while the grown-ups wait until it is time for the peacocks to appear. 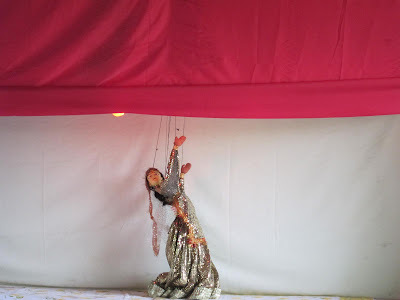 Mayur Baug has a kids park, a magic show, a puppet show and a farm full of geese, turkeys, horses, camels and other livestock. While the magic show and puppet show were fun - especially since they were in the middle of rustic surroundings, the livestock were in a sorry state of neglect. 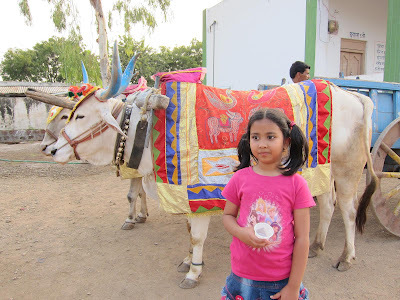 There are even bullock-cart rides and tractor rides for those who book a package in advance. As the sun began to set at 5 PM, the first peacocks began to make an appearance. They slowly appeared from the forests into the surrounding fields. 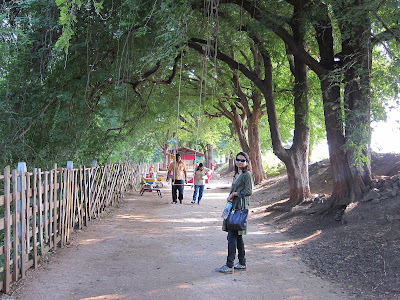 Mayur Baug has a very nice viewing gallery which was by now full of tourists excited to see the birds - with their shiny, velvety green necks and long tails. Peacocks - the male of the species - are the ones with the flashy tails. The female and young males do not have the tail feathers but still make for a beautiful sight. the female lays eggs in the ground, but interestingly keeps a few 'decoy' eggs away from the ones she is laying to keep away predators. They usually sleep in the night on trees. A ticket to Mayur Baug includes a complimentary chai with kanda bhajis. They were worth the wait - and after wolfing them down we began our drive back home. All in all, a fun day. 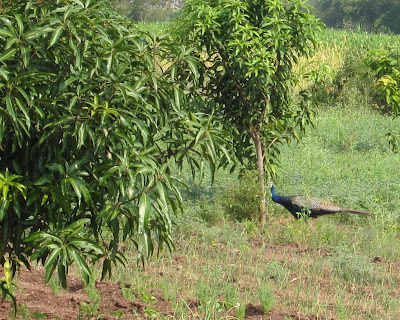 Incidentally, another place near Pune we had run into peacocks was on the way to Mauli Hills. PS: During the evening, you can buy fresh greens and vegetables at very low prices directly from the farmers near the entrance of Mayur Baug. I remember devouring Jiggs Kalra's foodie columns in the Times of India during the 90s. One of India's most known food columnists and gastronome, his recipes contributed to my growing interest in culinary delights during that time. I recollect being foxed by the term bouquet garni in his recipies and finally figuring out - remember those pre-Google days?!! - what it meant. 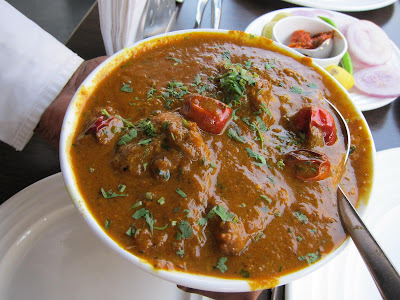 Therefore when I found myself in front of Jiggs' own restaurant, Punjab Grill, during a recent trip to New Delhi, I had to drop in and sample the fare. 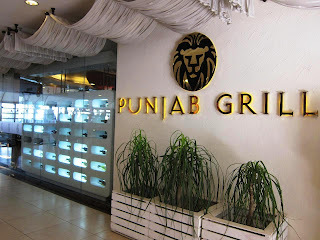 The Punjab Grill I visited is located in Saket within the upscale Select Citywalk Mall. 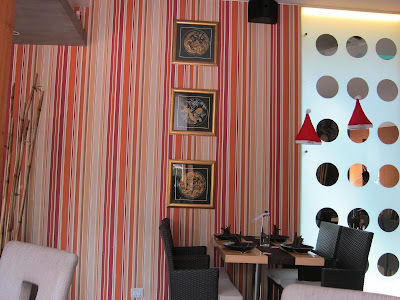 It's sister restaurant is located in Gurgaon's Ambiance Mall. 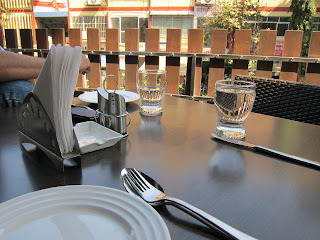 Punjab Grill in Saket is divided into two different areas: a indoor fine-dining room and an open-air terrace. 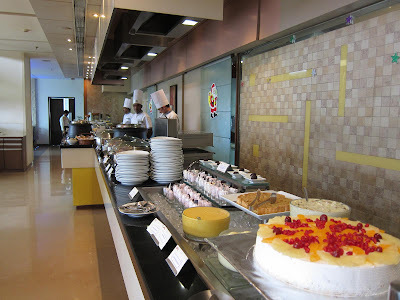 For lunch, the indoor dining room serves a lunch buffet while the a la carte menu is available on the terrace. We decided to choose the terrace and sample items off the menu. I was here with my family. After some deliberation, we decided to order a kabab platter, makke ki roti and sarson da saag along with a portion of their famous daal. I recall an interview of Jiggs Kalra where he pointed out historical evidence to suggest that kababs may have existed in the Indian subcontinent even before the Persian invaders came here. 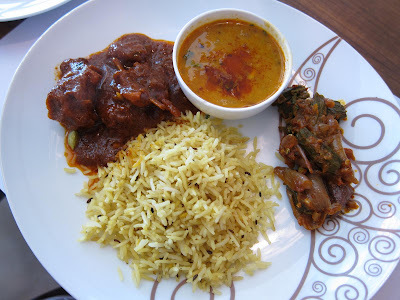 He cites a treatise written by 12th century Chalukyan ruler Somadeva in which a dish called bhaditraka is described. This dish was made of meat in which spices were stuffed before being roasted on spits. 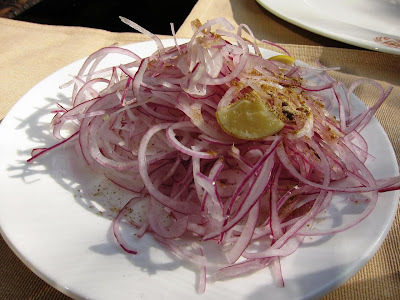 A plate of laccha pyaz came in first: finely cut onion rings - or rather spirals that was liberally sprinkled with chaat masala. The kabab platter gave us an early indication of the portions: huge Punjabi-sized! 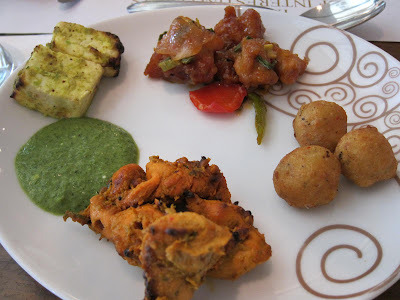 The platter contained Murgh Tikka, Murgh Malai Tikka, Amritsari Machchi and Chaamp Taajdar. 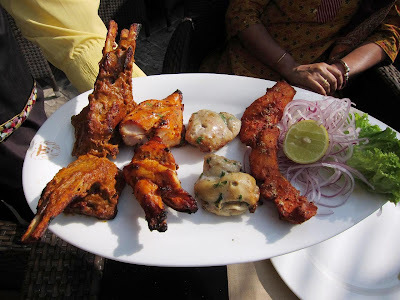 I began with the mildest, the Murgh Malai Tikka - morsels of chicken marinated in yoghurt, cashew-nut paste and cheese before being cooked in a tandoor. 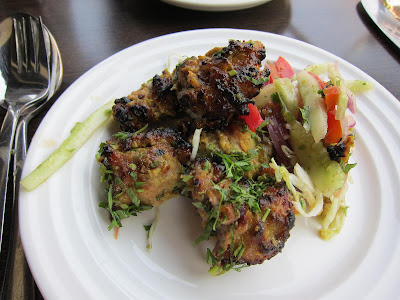 The kabab was perfect - aromatic and very tender. The Murgh Tikka, a house speciality, was made of boned pieces of chicken marinated in royal cumin, fresh cream, cheddar, garlic and a hint of fresh coriander before being glazed in the tandoor. This was a more robust, spicier kabab with the cheese giving it a distinct, soft taste. The Amritsari Machchi were fillets of Singhara fish that had been dipped in ajwain-flavored gram flour and deep-fried in mustard oil. This was probably the one we loved the best. 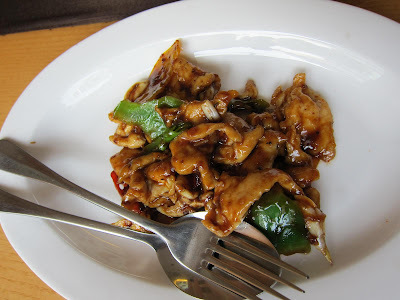 Absolutely done right with a crisp, tasty exterior and a flavorful and soft inside. Finally, the Chaamp Taajdar which was lamb chops that had been pot-roasted in an infusion of cloves, black cardomom, kasoori methi and basil before being grilled on a tandoor. Ample-sized and very tasty indeed! The waiters were ready with the rest of our food. 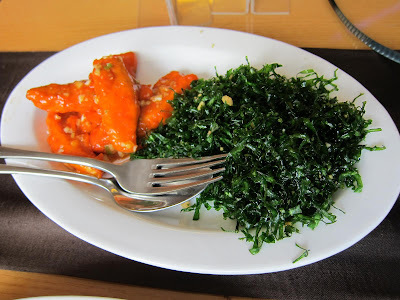 A large portion of sarson da saag showed up. This popular winter dish from Punjab made with mustard greens cooked in earthern pots with radish leaves, bathua, ginger, gram flour and a dash of mustard oil was absolutely delightful. Not unexpectedly given Jiggs' Punjabi origins. 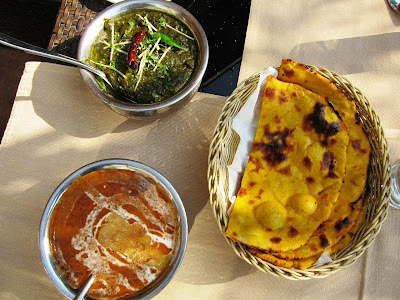 The makke ki roti - breads made of corn flour in the tandoor - that go with this dish were perfectly turned out too. Dollops of home-made butter made the dish heavenly in the nip of the winter morning. The Daal was made of whole urad simmered overnight with a trace of mustard oil and finished with a tomato puree and cream, finally tempered with ghee. 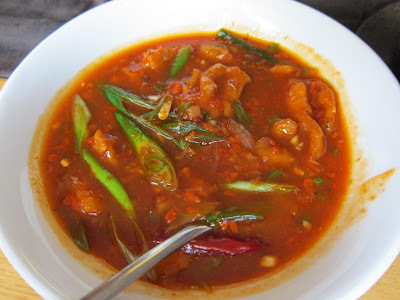 Again fantastic in taste and texture. In spite of the portions, there wasn't much left on the plate when we finished our lunch! 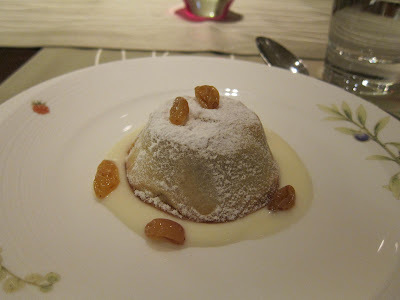 Even though we were quite full because of the ample portions, I had to try a dessert. The waiter recommended the kheer. 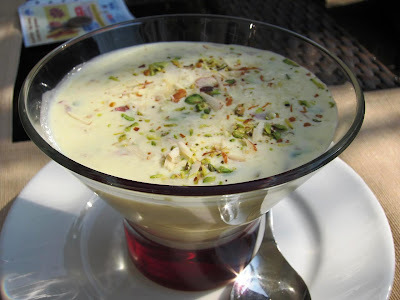 The rice-based kheer in thickened milk was liberally sprinkled with nuts. 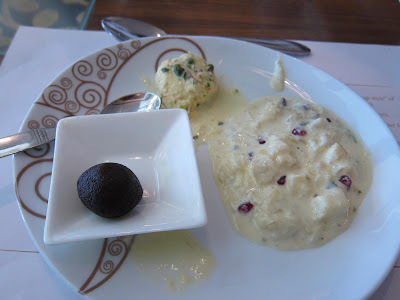 The kheer was heavenly, the taste of rabdi with aromatic rice, nuts and a hint of kewra. For lovers of Punjabi food, I strongly recommend this restaurant if you are anywhere near Saket. 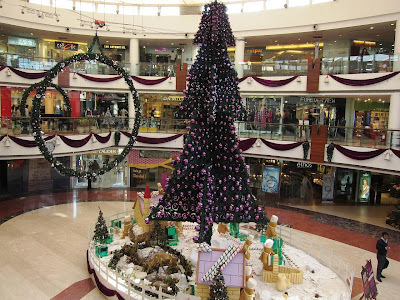 For visitors to Delhi, the mall is about 30 minutes from the airport, and home to a multiplex, several upscale branded shopping outlets and restaurants. A good place to kill some time if you have any when visiting this city. Dear foodie friends, wish you a fun-filled, food-filled New Year! May this be the beginning of a very exciting and successful decade for all of you.